Experience super fast motorbike racing like never before with the Storm Rider 42" DLX Riding Machine. Players can compete on 11 different superbikes over 11 motorcycle racing tracks based in major locations like Harbour, Forest and Old Flight Facility. Up to 4 Storm Rider machines (8 players) can be linked together for head-to-head tournament action. During the Storm Rider game, players will feel a high sense of speed and adrenaline. Players have 11 tracks to select from and have the potential to unlock another 6. Furthermore, there are 10 different bikes players can race on and also have the opportunity to unlock another 5 bikes. Once track and bike are selected, there is the choice between single and multiplayer modes as well as beginner and drift modes for the expert racers. Storm Rider features an impressive eye catching LED lighted cabinet with a 42" HD widescreen LCD, powerful 2.1 sound system, vibration speakers, unlimited boost system and high frame rate speed gameplay. All these features combine to make an impressive motorbike racing game that cant be beat and will draw players across the floor time and again. Players can compete on 11 different superbikes over 11 motorcycle racing tracks based in major locations like Harbour, Forest and Old Flight Facility. Up to 4 Storm Rider machines (8 players) can be linked together for head-to-head tournament action. During the Storm Rider game, players will feel a high sense of speed and adrenaline. Players have 11 tracks to select from and have the potential to unlock another 6. Furthermore, there are 10 different bikes players can race on and also have the opportunity to unlock another 5 bikes. Once track and bike are selected, there is the choice between single and multiplayer modes as well as beginner and drift modes for the expert racers. 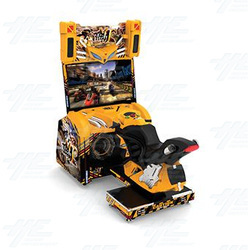 Storm Rider features an impressive eye catching LED lighted cabinet with a 42" HD widescreen LCD, powerful 2.1 sound system, vibration speakers, unlimited boost system and high frame rate speed gameplay. All these features combine to make an impressive motorbike racing game that cant be beat and will draw players across the floor time and again.